After finishing that Cerebella piece, I had the growing nerve to draw another fanart. I tried to come up with reason to do another Skullgirls piece, but just couldn’t find any inspiration to do any of the other characters while keeping it appropriate for all viewers. So, I turned to my favorite fighting character of all time – Q-Bee. 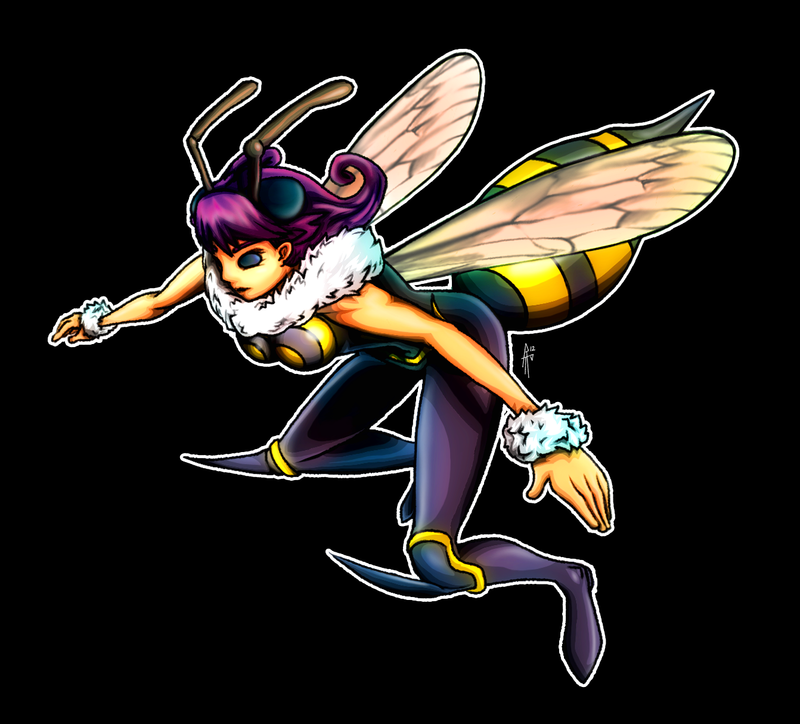 Quite possible the coolest Darkstalkers character of all time, I am rather disappointed that she does not show up in the newer next-gen games. I don’t know what it is about bee characters, but Wasp is also my favorite female superhero in the Marvel universe… interesting. Maybe I’ll do her next? Either way, it’s back to school for me now that break is over. I have to give a speech next Monday and I’m not looking forward to it! Accidentally flattened my PSD for this image, but was able to save out some in-process images beforehand. You can see the process on my facebook! This entry was posted on 04.09.2012 by Ryan M Paxton. It was filed under Artwork and was tagged with 2D, anatomy, capcom, darkstalkers, drawing, felicia, female, fighter, fighting game, figure drawing, finished piece, lilith, morrigan, playstation, ps3, psn, q-bee, qbee, queen bee, queen-b, queenb, sketchbook, sketches, snk, udon.